I finished little G’s mittens. I strung them together with i-cord instead of a chain of crochet. I find it sturdier and not so stretchy. Besides for some odd reason I love to knit i-cord. You can probably see that the mittens are a darked blue then the rest of the set. I bought the wrong yarn by mistake. I should have bought Bernat’s navy not Red Heart’s navy. It’s not very noticable and the mittens are far enough away from the hat and scarf that I think it’s okay. Next is little A’s set. 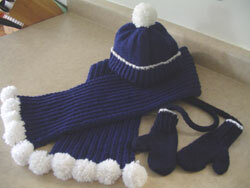 I love the colour,they are nice and so nicely knitted. If you hadn’t mentioned the yarn substitution I wouln’t have noticed it. I think no one will. Good job!